In today’s multi-platform, multi-device world, traditional help desk systems often feel sluggish and outdated. Companies in the know realize that tickets can come from a variety of sources, so having a solution that integrates chatter from as many sources as possible is the best way to stay on top of customer needs. With an eye on addressing the changing face of customer service needs, Deskero has taken the basic functionality of a help desk system and made it smarter. From streamlining ticketing processes to building a better knowledge base management system, Deskero provides your company with an all-in-one point of contact for valuable customers. Deskero has one of the easiest set-up processes that we’ve seen- just pick your .deskero.com URL, put in your email and a password, and you’re done. The platform provides step-by-step instructions on linking up your email and social accounts, but even without the instruction the route is clear enough that you can go from creating a login to using the platform in under ten minutes. Overall, the dashboard has a clean, simple interface for a fast learning curve. 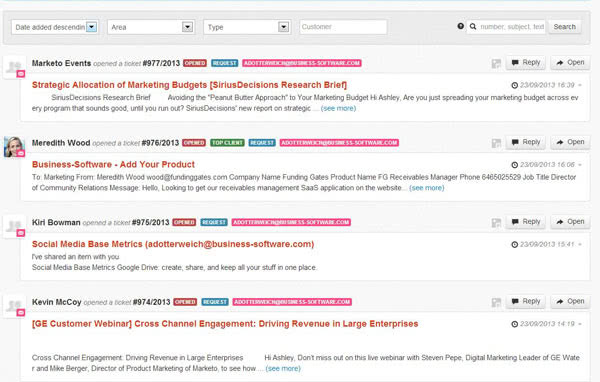 Tickets, social monitoring, knowledge base and customer profiles are all accessible with a single click. Deskero’s ticketing system works pretty much like your standard ticketing system, but with a few tweaks that make it much faster and easier to use. The One Click Reply feature lets you answer any ticket immediately, and the ability to set standard reply macros helps you get through your list of tickets faster, letting you spend more time on more challenging requests. One of the highlights of Deskero’s approach to customer service is their focus on creating a unified point of contact for customer interactions. They’ve put a premium on fostering social engagements rather than just reactions to customer queries, putting Deskero on the forefront of the emerging trend among cutting edge help desk tools that focus on building up two-way relationships with customers rather than striving to give them the bare minimum interaction required to answer their question and move on. 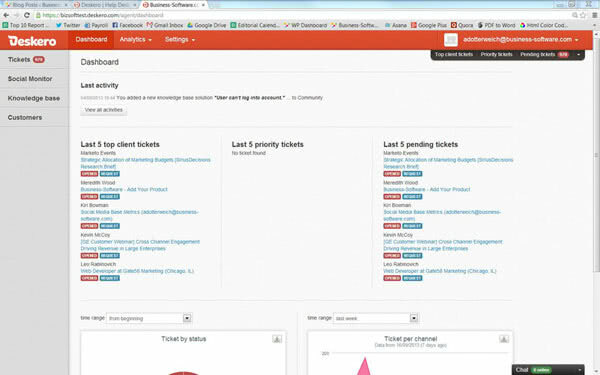 Great ticketing functionality aside, what really stands out about Deskero is the integrated knowledge base feature. Help desk staff can easily input topics as they go, which is particularly great for companies with new or evolving products or services without a well-established knowledge base. Users and customers and also submit proposals for content, making Deskero’s knowledge base a great way to crowdsource your knowledge base and let it grow organically. Deskero stores contacts and lets you add information and edit profiles, in a sort of abbreviated version of a contact management system. 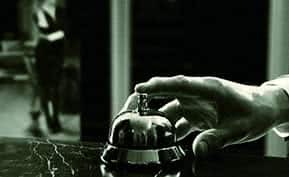 One nice feature is the ability to tag and monitor top clients, ensuring that your VIP customers get the treatment they deserve, and that critical requests never fall through the cracks. If you rely on a heavy-hitting CRM for managing your customer base, Deskero’s system isn’t going to be an adequate replacement for it. But the feature is still an excellent addition, especially if you often deal with drawn-out queries or recurring interactions with customers. Another feature we like is the ability to gather social IDs into a single place. Since you’re constantly receiving requests and feedback from a variety of sources, being able to consolidate a customer’s Twitter handle, Facebook profile and email address into a master profile makes for better interactions in the long run. What we love most about Deskero is its focus on pulling together all of your company’s interactions with your user base into a single platform, making it easy to manage your customers’ requests no matter how they reach you- via chat, email, social media or beyond. Deskero has taken the key ideas behind building a great customer support system and developed a way for companies to achieve better relationships with their customers. Deskero offers a free basic plan and feature-rich paid versions of their platform starting at the very affordable rate of $15/agent/month. Check out a free trial of all their Power features for a full month at www.deskero.com. Looking for more information on top help desk software solutions? Check out our customer service research center page for blog posts and reviews of the top help desk software products. To find the best solution for your business, compare help desk software in our Top 10 Help Desk Software report. Ashley Dotterweich is a former Business-Software.com marketing team member who writes about tech industry trends and the software selection process. She was on the marketing team at Business-Software.com from 2012-2014.